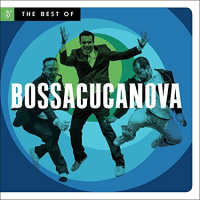 Advancing the music of their native Brazil, BossaCucaNova has achieved what few bands have in a relatively short time period in the grand scheme of a career. Their story begins about two decades ago, when three friends, DJ Marcelinho DaLua, Alex Moreira and Marcio Menescal, the son of bossa nova pioneer Roberto Menescal began remixing classic 1960s bossa nova for the posterity of the music. Five albums later, their The Best Of compilation offers up their “best arrangements, most original beats, and top performances,” says Marcio, plus two exciting new tunes as an added bonus to a fine recording. A superb blend of the best of historical flavors of Brazil, melded together with a modern sound can be enjoyed throughout. The opening tune, “Berimbau” features Os Cariocas, a Brazilian vocal group founded in 1942 with great result. “Berimbau” is named for one of Brazil’s oldest, most revered stringed instruments; Marcio gives reverence to his father’s original recording of this tune, now recorded in a modern sonic soundscape. Os Cariocas also returns for “Adeus América” adding a tropical flavor guaranteed to please. A highlight on this track Marlon Sette’s trombone solo, supported by vivid horn arrangements. “Meditação” gives the listener a bit of historical from Roberto Menescal’s original recording: son, Marcio adds the spice of his generation with a hip-hop groove and then seasons the tune with the languorous vocal from Wanda Sa, who guest starred on Sergio Mendes’ Brazil ’65. The beat is honey sweet with a lingering melodiousness. Electric guitar illuminates fluid verses of “Água De Beber” with percussive poppin’ and vibrant horns that offer moving counterpointing choruses. “Índio Quer Apito,” is one of the new tunes on this brilliant offering, written for Carnival but firmly rooted in a traditional carioca song from the ’60s, it honors Brazil’s Indian heritage echoing chants and war cries that glisten into frosty reflections through whirling, electronic swaying sounds. Overall, The Best Of is not an understatement not only is it a recap of what you love best about BossaCucaNova, it is also a sampler of why. Adding in the two new tunes is just icing on the already devilishly tasty cake. Be the first to comment on "Bossacucanova, The Best of Bossacucanova"